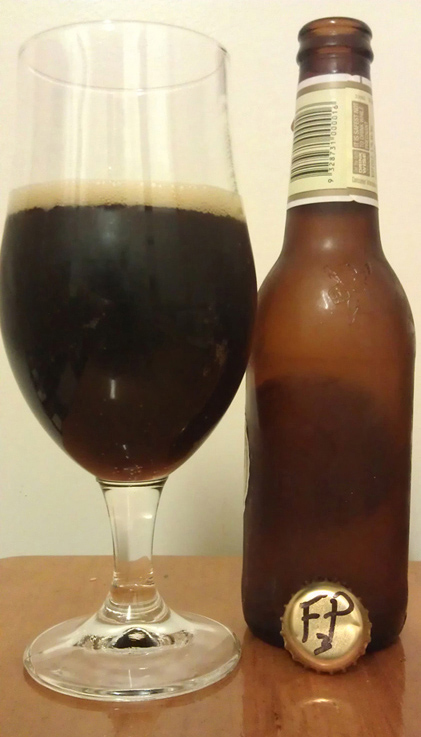 Way back on 29 July Chas made the third version of The Friedlieb, his coffee porter. This latest version is an all grain. And it’s pretty bloody good. All the relatively fresh coffee that went into this helps drive this beer. The aroma is simply great. Big coffee and molasses hit in the nose. Good smoke end to the aroma, long and lasting but not harsh. This really draws you into the beer. Up front this beer is a little deceptive. The dark malt feels somewhat light but the smoke is there. Plenty of peated malt. Chocolate is there at the start and coffee too. The rye malt is a little harder to pick up. Slightly overpowered, but giving some backing to the rest of the malt. The hops are not really there, but more to help balance. There’s a big mouth feeling to this beer. Small bubbles give it a sort of creamy hint to it. After the first impressing the smoke and coffee take over. They’re mixing around and washing together. The alcohol in this is 6.8%, though you don’t really notice any of that anyway. The smoke and coffee cover it very well. All the peated malt takes over and this does get slightly too much. That’s when it’s cold. Once this beer warms up there’s more of a slight sweetness to this. The chocolate malt comes out a bit and the brown malt flavour comes out a lot more. There’s a biscuit/toast flavour to it. But it’s the coffee that really becomes the king flavour and reminding you that there really was a LOT of coffee put into this beer. The downside for me is the smoke from the peated malt. When I reviewed the second version of The Friedlieb I mentioned that Chas was really looking for this. It’s too much for me. Chas really wanted to push this, and I think it’s something he really likes. Don’t get me wrong, this is a well made beer with good complexity, nice body and long lasting flavour. For me one bottle is enough. This is a beer for the end of the night. At home, settling in for the night and have next to a fire. Don’t need anything to eat because this beer is full of character and flavour. Maybe not the last beer, ‘cos the coffee will keep you going. But a good solid flavour hit to slow things down.